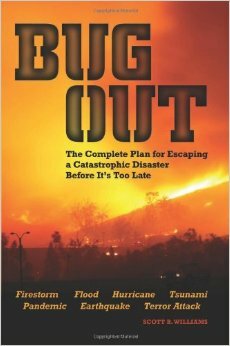 Scott Williams book BUG OUT – The Complete Guide for Escaping a Catastrophic Disaster Before It’s Too Late has been on my nightstand for quite some time. A review is long over due. Bugging out is not a major aspect of my preparedness system however this book has certainly provided some perspective. “Bugging in” should the SHTF is my main plan. BUG OUT really opened my eyes. I have realized that I have to consider the possibility that it may be necessary to relocate in the event of a crisis situation – and it is not just a matter of jumping in my 4×4 with the wife and kids and head’n down the road. Bugging out requires planning and research. When I started reading the book Williams tries to break the the myths of bugging out in Chapter 1 – The Fantasy & the Reality of Living Off the Land. He makes a valid point discussing that it took a very long time for humans to go from living in the stone age to what is considered living civilized today. He suggests that it will not be very easy for people to just “head for the hills” and return to a more primitive lifestyle. Over the years skills and knowledge to exist successfully in the wilderness has been lost by most. Williams expresses the need to educate yourself and be properly prepared to successfully “Bug Out”. Chapter 2 – The Bug-Out Bag & Stuff You’ll Need to Survive does an excellent job educating the reader in what a bug out bag is as well as putting one together. 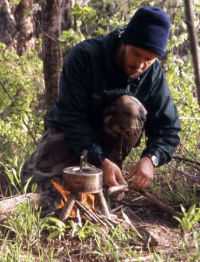 Williams discusses topics from the different types of bags to consider, clothing needs, to specific tools that are useful in a bug out situation. Other chapters include information on transportation methods, bug out location selection, making caches, and there’s a helpful checklist for putting together a bug out bag. What is very impressive is this book provides detailed information on many of the best “Bug Out” areas in the United States. Overall – I found this book a great read and very educational. As stated at the beginning – bugging out has not been a major component of my preparedness system. The author did a very good job opening my eyes to the possibilities of bugging out. By the way – the author Scott Williams has a great blog called BugOutSurvival.com. I also interviewed Scott awhile back – see it here.